Are you thinking about changing your garden into a lively summer venue for friends and family? 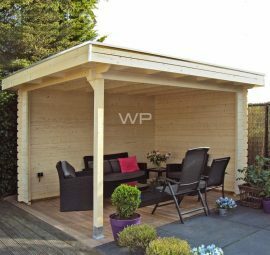 Choose for a wooden gazebo from Woodpro and you have a perfect retreat in your garden to relax in during the summer BBQ’s. At Woodpro we offer you a wide range of styles and sizes, so a wooden gazebo would fit in your garden every time. Think about last summer, did you have to go back in the house every time there was an occasional summer shower? This year could be different, build a wooden gazebo in your garden and the occasional shower is no problem at all. 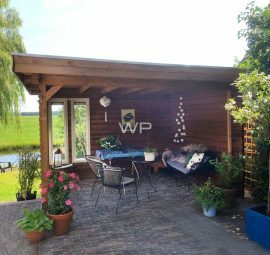 We at Woodpro have been producing wooden gazebos since 1978. We always strive to delivering you the best quality wooden products. Because we have such a long history in this business, we have a lot of experience and of course we are always committed in improving our product every day. A wooden gazebo has many advantages in comparison to brick or metal structures. A gazebo made of wood has a more natural look and feel. Furthermore, with our unique 3D-configurator you can make a gazebo that fits in every garden. Compared to a brick or metal structure the price of a wooden structure is much more interesting. You get great quality for a very affordable price. Feel free to get in touch with Woodpro to learn more about all the benefits a wooden gazebo can have for you. When considering a wooden gazebo, you obviously want the best quality possible. With a great quality gazebo, you will add a great eye-catcher to your garden. Furthermore, a structure of the best quality wood will have a great influence on the durability of the structure. At Woodpro we only use the best quality wood possible for all the different structures we produce. Of course, Gazebos are included in this. 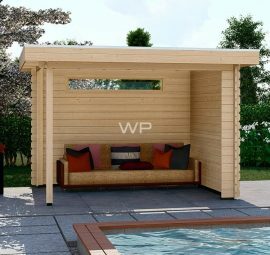 You probably will put your lounge set under the gazebo and due to your choice for Woodpro you get a quality structure that will not quickly fall apart and damage your belongings. The wood we use comes from the most northern parts of Europe. The climate in these parts of Europe is much colder. The cold makes the trees grow much more slowly and the rings of the trees stay closer together. This makes for the timber to become much stronger and more solid. If you are thinking about environmentally friendly, you also have the right partner when considering Woodpro. We ensure that all the wooden products we produce are completely recyclable. We will do everything in our power to ensure minimal wood waste. The waste we do produce is used again for other purposes. 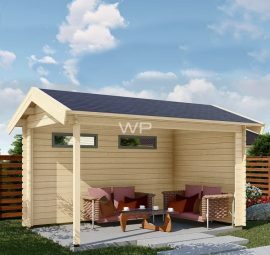 Do you already have a picture in your mind of the wooden gazebo you prefer? What great way to change this mental picture into a real design. Use our 3D-configurator which is very user-friendly. No matter if you are considering a small gazebo, a large gazebo or one with specific measurements. 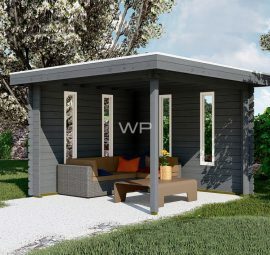 It is all possible in the configurator, you can specify the type of structure, the height and the size of the construction. In the configurator it is possible to change specific elements that you wish to adjust. With the configurator it is easy to build a wooden gazebo that perfectly fits in your garden. If a standard gazebo fits in your garden why not consider a standard wooden gazebo? On our website you can find a wide range of pre-designed wooden gazebos. In the standard wooden gazebos, we offer a wide variety of products. There are numerous sizes, heights and shapes available. If you are wondering about the prices, don’t worry. A wooden gazebo is possible for everyone. You can already have a Woodpro gazebo in your garden starting of at the low price of £1,340, -. 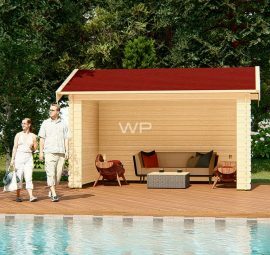 For this price you get a wooden gazebo with a width of 350 cm, a depth of 250 cm and a wall thickness of 28 mm. The ridge height of this gazebo is 240 cm and it comes with a flat roof with an overhang of 30 cm. The wood used for this gazebo is first class spruce from northern countries which is 14 – 16 % kiln dried. Furthermore, in this price you get the assembly material, the aluminium rooftrim, a complete EPDM-kit and the pressure treated foundation beams. Wooden gazebos are becoming more and more popular. Due to the additional design options, they become much more than just a shelter from the sun. Similar to a canopy, with a wooden gazebo you get that great outdoor feeling. It gives you the possibility to enjoy your garden in the summer while protecting you from intense sunlight. Also, a wooden gazebo protects you from rain and wind. In the designs we offer it is also possible to add windows to the gazebo. This makes it possible to create an area in your garden which is light and open. A garden building that can be used for many different purposes. It will become a great and beautiful focal point in your garden. Parties will never be the same again when giving them in your new garden with a beautiful wooden gazebo. Why would you wait any longer? 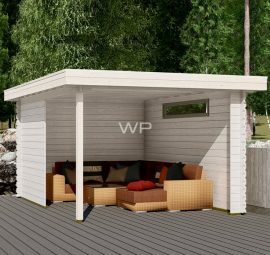 Discover our great range of wooden gazebos and the various possibilities our 3D-configurator has to offer. At Woodpro you will find the perfect design for your garden. You can use our filter options to find the best gazebo for your garden. And as mentioned before, if we do not have a standard gazebo, you can create one you like with our easy to use configurator. If you have any questions, please don’t hesitate to contact us. We will be happy to assist you in finding the right gazebo for you!